You may wish to have personal in-home training with me, working personally with you and your dog. I often travel to clients' cities to help them with in-home training. At this time, I do not offer mass dog training classes at my facilities, or anyone else's. I did at one time, but was left with the feeling that my students, both two and four legged, were not getting the attention they deserve. Again, for me, it was a matter of integrity. No two dogs are the same. Without individualized training, something can, and most likely will, be missed. Mass training classes are a great way for a trainer to make quick money, but is it really the smart way to do it? I don't think so. We've all seen the way our dogs act the first time they enter a new area, whether it's a friend's house or a park. The dog's nose hits the ground, and they start to explore. They will examine unfamiliar structures, sounds, smells, people and animals. It's instinctual! They will do this until they reach a level of comfort and security with their new surroundings. For some dogs, this process will only take a few minutes. Some may take several hours. With this in mind, how can we expect a dog that is already having "issues," to be placed in a situation where they have not been able to establish a comfort level? How will he stay focused on the task of training? This is contradictory to the natural, instinctual learning process of the dog. One step forward, two steps back. In the case of in-home training, we will do an initial telephone consultation. 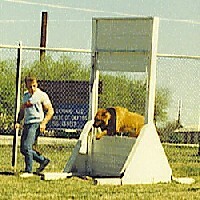 Remember - when hiring a trainer, you are making a commitment to your own success in shaping your dog's behavior. As with telephone coaching, we use this time to see how we both feel about working together. It's simply a matter of integrity. I will provide you with my evaluation form, which will need to be filled out before we begin the actual training sessions. After our in-home sessions, you will receive an in-depth written behavioral analysis based on your dog's current condition. You will also receive a highly individualized training program for you to use for continued training, based on this behavioral analysis. Save time and money driving to training sessions - and time IS money! Save hundreds of dollars on electronic devices - which we do not use! My telephone number is listed below. I don't always have immediate openings available, but please feel free to call me directly for your initial appointment. We'll get you scheduled for the first opening I have. If I'm out on a training session, please leave a message and I'll return your call as soon as possible! With proper direction and cooperation, your dog will truly be your best friend for life. You both deserve the very best in learning to live together as a happy, cooperative family. I look forward to meeting you with that as our goal! Take my 7 Day Mini-Course on dogs and puppies, "Beginning to Understand Your Dog". Just tell me your first name and email address and you'll receive the first installment momentarily.